BELLINGHAM, Wash. — Mike Connolly will not be back with the University of Maine baseball team for his senior season, after all. The talented right-handed pitcher on Friday agreed to terms with the San Francisco Giants, who drafted him in the 27th round (No. 822 overall) in this month’s major league draft. “They gave me what I want and school so I took it!” Connolly said in a text message Friday evening. Connolly reportedly will receive a signing bonus of approximately $50,000 and will have the cost of his remaining undergraduate education paid by the organization. He had reported this week to the Bellingham Bells of the West Coast League, his planned summer destination prior to being selected in the draft. There, the 6-foot, 190-pounder is playing alongside Black Bears teammates Alex Calbick and Luke Morrill of South Thomaston. “Bellingham is great!” Connolly said earlier Friday, when he had expressed optimism about getting a deal done sooner rather than later. Instead, he won’t be hanging around the Northwest. Connolly will report soon to San Francisco’s rookie team in the Arizona League. Connolly successfully handled double duty for coach Steve Trimper’s UMaine ballclub during 2013. He was the starting catcher and also held down a spot in the starting rotation. On the mound, he posted a 6-4 record with a 2.11 earned run average, giving up 60 hits in 76 2/3 innings. He struck out 46, walked 26 and held opponents to a .221 average. The strong-armed catcher also was a weapon behind the plate. Connolly threw out 27 of 52 potential base-stealers and batted .310 with one home run and 14 runs batted in. He became the first player in America East history to be accorded all-conference honors at two different positions. He was named the first-team catcher and was on the second team as a pitcher. Connolly is a finalist for the John Olerud Award given to the nation’s best two-way player. It will be presented June 30 as part of the annual College Baseball Night of Champions in Lubbock, Texas. Connolly is among the college prospects who are increasingly leery about signing a pro contract that includes a signing bonus at the lower end of the spectrum. Teams may not offer more than $100,000 for a signing bonus to players drafted after the 10th round. As former UMaine pitching standout Keith Bilodeau found out last year, the less money an organization spends on a player initially, the easier it is to sever ties if things don’t work out right away. Bilodeau was drafted by the Giants in the 24th round in 2011, signed a contract and remained with the organization until last year, when he was released. He is trying to keep his career alive with Bridgeport (Conn.) in the independent Atlantic League. 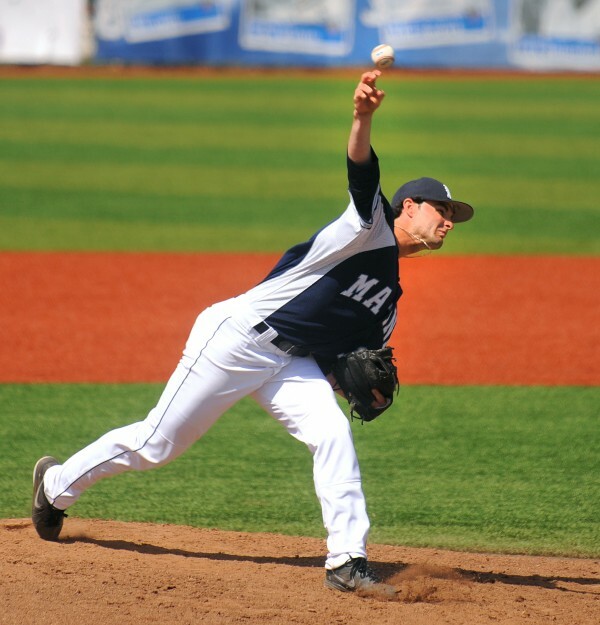 Former UMaine right-hander Jeff Gibbs was drafted in the ninth round by Arizona in 2012 for a reported $90,000 bonus, but was released at the end of last season. He has not hooked on elsewhere. Connolly hopes to buck that trend with the Giants. UMaine senior right-handed pitcher Tommy Lawrence is among three Black Bears who have added to their 2013 postseason accolades. He has been named to the American Baseball Coaches Association All-Northeast Region Team. The America East Pitcher of the Year posted an 11-3 record with a 2.32 ERA and 78 strikeouts in 104.2 innings and set the school single-season record for wins. Teammates Eric White of Brewer and Mike Fransoso were All-Northeast second-team selections. Lawrence is gearing up to begin his summer season with the Chatham Anglers of the highly regarded Cape Cod Baseball League. He ended the season by pitching a two-hit shutout in UMaine’s America East tournament opener against Stony Brook on May 22, then hurling 5 1/3 innings of one-run ball two days later, throwing a combined 223 pitches. “He’s still home. He’s been taking some time off,” said Trimper, who explained Lawrence is enjoying some down time after a busy spring with the Bears. “He’s just starting to throw some bullpens and he’s getting ready to go to Chatham,” he added. White, an All-America East first-team pick at third base, hit .347 and led UMaine with six home runs. White scored 38 runs and drove in 37. He posted 10 doubles and featured a .944 fielding percentage. Fransoso, the 2013 America East Player of the Year, finished his senior season with a .352 average with 49 RBI, 45 runs scored and 20 stolen bases. He also stroked 17 doubles and had a .941 fielding percentage. Fransoso was drafted by the Pittsburgh Pirates in the 27th round of the amateur draft and is playing with the Class A Jamestown (N.Y.) Jammers in the New York-Penn League.